When I was young, I hated Brussels sprouts; I thought they were bitter and yucky. Now that I am older, I really like vegetables, especially the “yucky” ones. Jill and I look forward to Brussels sprouts being in season each year, but we found that we fell into a pattern of making them the same way every time, so we wanted to branch out and prepare them in a new way. 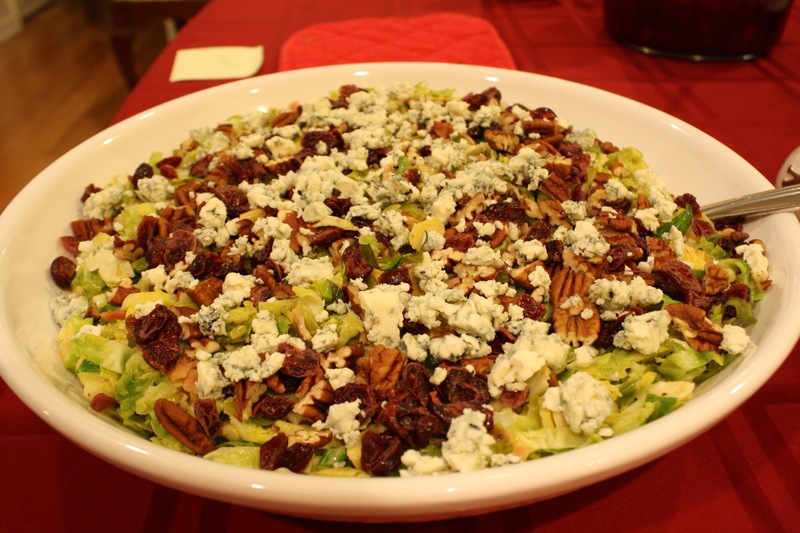 Jill did some research on Pintrist and found a recipe for Chopped Brussels Spouts with Dried Cranberries, Pecans, and Blue Cheese. We were both intrigued by the recipe, but we wanted a recipe where the Brussels sprouts were cooked instead of raw. For Thanksgiving, I followed the recipe exactly, except I sautéd the Brussels in olive oil until tender. Jill’s Grandpa, who usually says he has “no use for those little cabbages,” even like them prepared this way. Although they were very good, I felt that the recipe needed something. So, I adapted that recipe and created this recipe. First, trim the outer leaves from 2 pounds of Brussels sprouts. 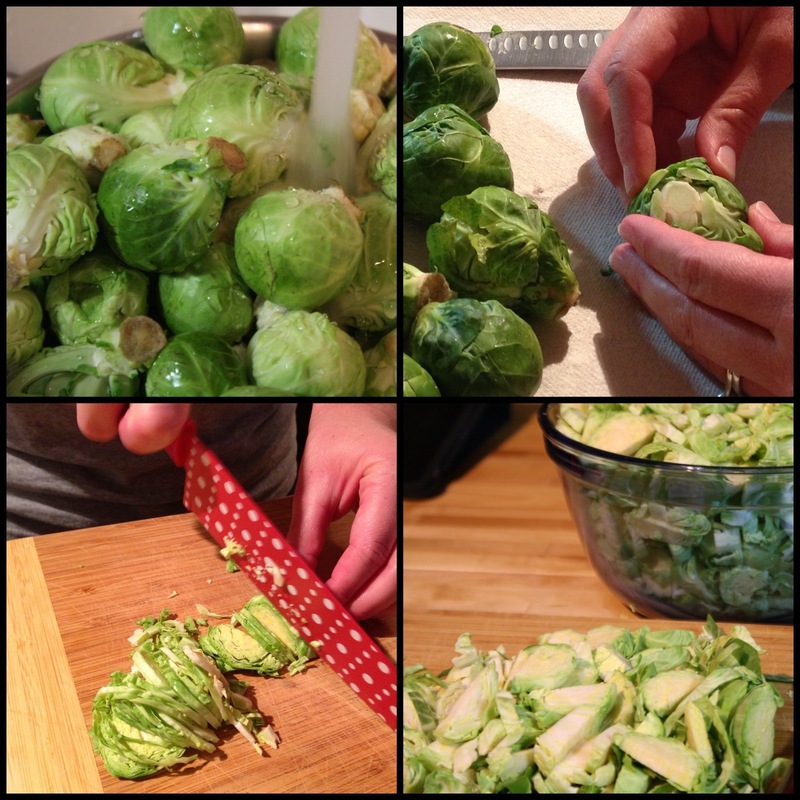 Rinse the Brussels sprouts in running water and pat them dry with a kitchen towel. Thinly slice the Brussels, discarding the stalky parts. 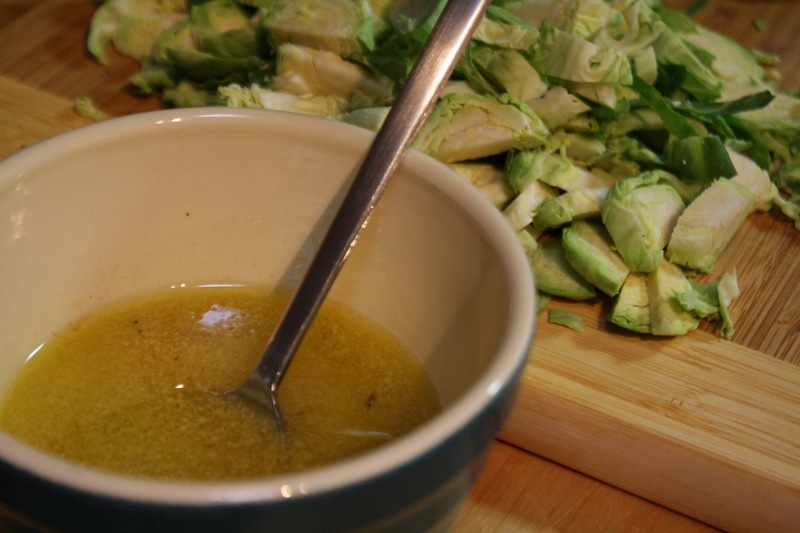 After preparing the Brussels, make the dressing by whisking together 6 Tbsp olive oil, 2 Tbsp apple cider vinegar, 2 tsp Dijon mustard, 1/4 tsp kosher salt, and 1/8 tsp ground black pepper. Put 5 or 6 slices of bacon (whatever will fit without overlapping) in a large sauté pan. Turn the heat to medium and cook the bacon until crispy. 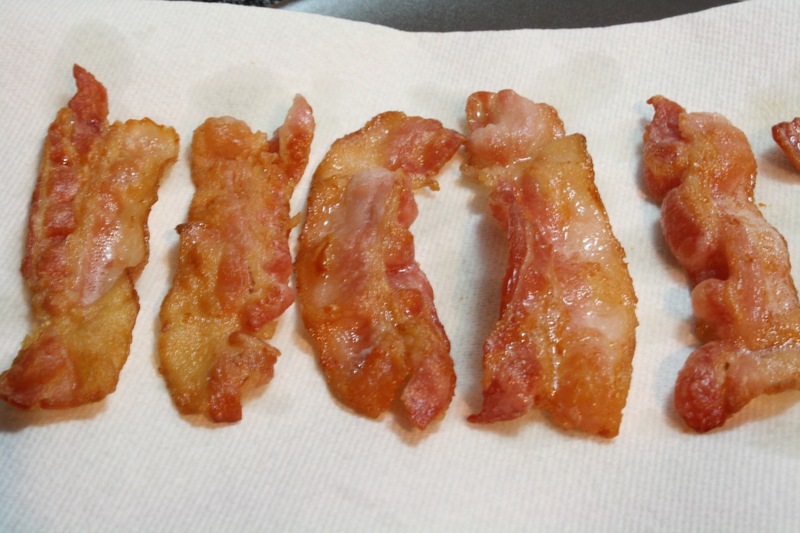 Once crispy, set the bacon aside to cool. Toss the prepared Brussels into the pan with the bacon grease and toss carefully until the Brussels are slightly wilted. Crumble the bacon into the Brussels. 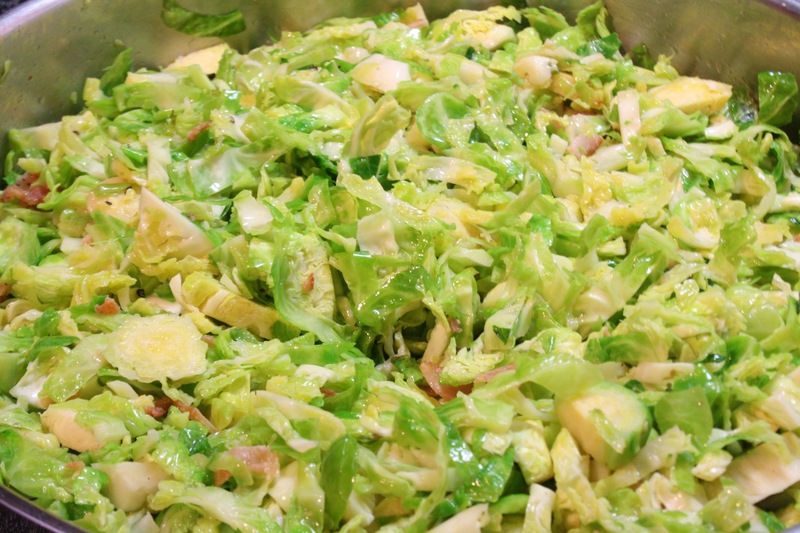 Pour in the dressing and mix until the Brussels are well coated. Pour the Brussels into a serving dish. Top the Brussels with 3/4 cup dried cranberries, 1 cup chopped pecans, and 1/2 cup crumbled blue cheese. Serve and change people’s minds about this “yucky” vegetable. Side note: Although I intended this to be served warm, the leftovers are also good served cold. I made a very slight variation on your Brussels sprouts salad recipe last night and loved it!!!! I used half cabbage and half brussels because that’s what I had in the produce drawer, and used balsamic vinegar to match the chicken I was making, but other than that I followed exactly and it was sooooo good. In fact my husband said he liked it “much more than the chicken” which is high praise from my meat-loving husband. 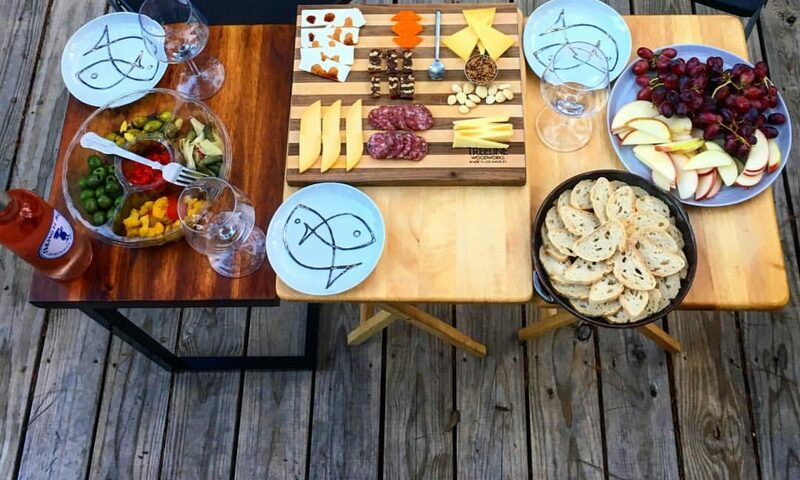 The flavors worked so well together, and it was quite a delicious and easy side for a weeknight! Thanks for sharing!